TBR [to be read] is a new feature on my blog, a semi-regular, invitation-only interview series with authors of newly released/forthcoming, interesting books who will tell us about their new work as well as offer tips on writing, stories about the publishing biz, and, from time to time, a recipe! MURDER and FIRE and REGRET. Okay, you wanted sentences: Emmy Fane has a boyfriend and a best friend, Kalen and Jessa Machrae; she loves them both and will do anything for either one of them. After Kalen has a car accident that leaves him severely brain-damaged but alive, Jessa intends to kill him because she can’t stand to see him this way, and Emmy has to decide: is she going to help Jessa or stop her? The black honey from laurel flowers is a real thing, by the way, although in real life it’s red, not black. It’s actually sold as a recreational drug in parts of Turkey. It’s a strange book. It isn’t really a straight-through novel—there’s an opening novella and then it splits up into clusters of stories in multiple possible timelines and alternate realities. The first part, Flashover, was published in a small magazine and nominated for a Pushcart, so that was great. But I didn’t even try the traditional publishing route. It seemed obvious to me that this book needed a small publisher who would understand and appreciate it. I sent it directly to a few, and I also went the competition route and sent it to both short-story collection contests and novel contests (since it’s both). With a competition, at least you know someone’s reading; it doesn’t go straight into the no-thank-you file. It came in second at SFK Press’s novel competition, and Steve McCondichie, the publisher, liked it so much he decided to publish it. SFK has been great. The editor, Eleanor Burden, asked me some hard questions about the morality of the central question of euthanasia, and whose life is worth living, and who gets to decide that, which made me go deeper into Emmy and Jessa’s motivations and greatly improved the book. I think that quality comes from quantity. Put words on the page. Lots and lots of words. Sooner or later, some of them will work. That’s a favorite, and another one is, don’t save anything. Don’t hold anything back for later. If you think of a great idea for a throwaway moment, use it now! If you think of a wonderful name for an insignificant character who will walk through a book and be gone in two pages, use it and let it go. Pour it all out. Only an empty cup can be filled. Going into the book, I did not at all intend to write the historical parts. (Actually, I didn’t expect anything; I just wrote the stories as they occurred to me.) Suddenly this modern South Carolina story had pieces beginning in China in 1897. That surprised me. I didn’t know I needed to go that far back. Also, I don’t know anything about early 20th century China, and I also didn’t research it, because the story is third-hand: Emmy tells the story as she remembers being told it as a child by Eldred Machrae, who told it as he remembered it from his mother, who was certainly lying about some things. Consequently, the historical reality doesn’t matter all that much. If I had researched it and made it more truthful, it would have been less authentic to the way family stories are passed along. The title was hard. For a long time, I just called it that book thing. I knew the title of the first part, Flashover, and I thought maybe that was the title of the whole book, but it didn’t seem to fit. Strangely, even as the whole book was nameless, the titles for the stories and sections were easy, and I kept taking chapter titles and trying to use them for the whole book. Roadside Cross was my second choice, but then I would have had to find a different title for that story. 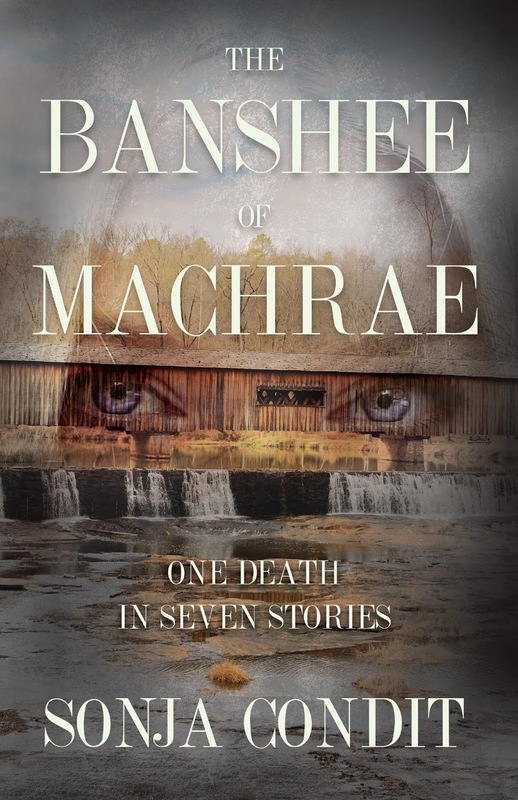 The Banshee of Machrae was the title of a story that I ended up cutting, so then I had an orphaned title, and it seemed to fit. Also, who is the banshee—is it Lilly or Emmy? I don’t know. It could be either. Inquiring foodies and hungry book clubs want to know: Any food/s associated with your book? Any recipes to share? There’s surprisingly little food. I’m sorry! You can buy mad honey, but you probably shouldn’t, since it’s, you know, literal poison. As the Machraes are a Chinese-Irish-American family, any combination of Chinese-American food and Irish food would be great! There’s also a scene with lemon bars which almost but not quite turns into murder. This is my favorite lemon bar recipe. Whatever you do, don’t look at the calorie count per serving. Some things are better left unknown.